I must say that this book is hilarious! Not because of the fact that the protaganist, Lyle, has been injured in a car accident and is now in a wheelchair, not it is hilarious because of what he is attempting to do. See I think that Lyle is really bored with his "new" life and needs something to do with his time. Enter a haunted house, Old Vic, has been around over 100 years, run down, only used by the homeless, mice and spiders, well also by the ghosts. Lyle sees an apparition of a young girl, who asks him for help. Old Vic used to be a brothel back in the day and there are some unhappy spirits that reside there. Lyle petitions the court to preserve this house. Not something they want to do. It is to be torn down to make way for a children's playground. Lyle has also seen his daughters name on a headstone and the date of death is looming for her. Lyle feels that saving this old house will also save his daughter. She is a detective who is investigating a drug and prostitution ring puts her in danger. A psychic by the name of Silk has discovered the story and exploits Lyle, plus a tv reporter out to better herself both put Lyle back into his old habits of drinking and eating the wrong thing. As his life turns into a media circus, how will Lyle save his daughter and gain respect in the community? With a cast of crazy characters, this book will make you laugh out loud and shudder at the same time. 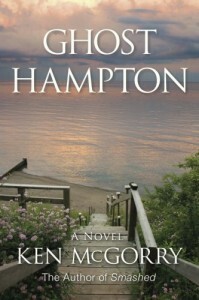 I enjoyed this book immensely and since this is book one, I look forward to further adventures of Lyle and the Hampton's!